Bostik V70 is a high-performance architectural grade structural glazing silicone. One component, non-flowing, Neutral cure, High modulus sealant. It cures by absorption of atmospheric moisture to form a flexible and durable elastomeric sealant. 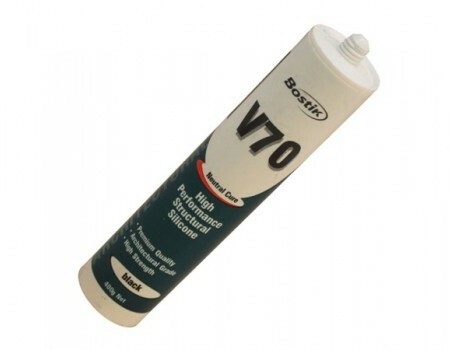 Bostik V70 silicone sealant meets the currently accepted engineering standards for structural glazing. This high strength silicone sealant has very good unprimed adhesion properties, to a broad range of building substrates. *(Substrate testing must always be carried out first). These features make this product a very good reliable structural adhesive sealant for both the Construction and industrial industries. The thixotropic nature of this product ensures that it will not slump in typical construction joints. Excellent U.V Stability Long Life Reliability Bostik V70 has excellent natural ageing stability. It will maintain its elastomeric structural joint sealant properties permanently, even under harsh conditions and temperature extremes.